Obama’s big gamble on Syria…. Arm-twisting time: Obama, Biden meet with congressional leaders at 9:45 am ET, while Kerry, Hagel, and Dempsey testify on Capitol Hill at 2:30 pm ET… A divided GOP… A divided Dem Party, too… When the rhetoric doesn’t match the action… And Cuccinelli, McAulliffe begin their final sprint. 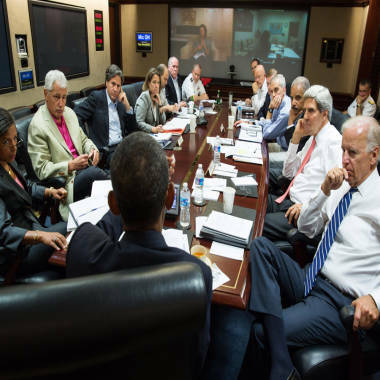 In this image released by The White House, US President Barack Obama (C) meets in the Situation Room with his national security advisors to discuss strategy in Syria on August 31, 2013. The United Nations has said that two million Syrians are refugees. The information comes while the White House is deciding what, if any, military action they will take against Syria's use of chemical weapons. NBC's Peter Alexander reports. *** Arm-twisting time: Here’s today’s arm-twisting activity for the upcoming Syria vote: At 9:45 am ET at the White House, President Obama and Vice President Biden meet with the leaders from the Senate Armed Services, Foreign Relations, and Intelligence committees and their House counterparts before Obama departs to attend the G20 meeting in Russia. Then, at 2:30 pm ET, Secretary of State John Kerry, Defense Secretary Chuck Hagel, and Joint Chiefs Chairman Martin Dempsey testify before the Senate Foreign Relations Committee (which Kerry chaired before joining the Obama administration). Kerry and Hagel will testify before the House Foreign Affairs Committee tomorrow. *** A divided Dem Party, too: But it’s not just Republicans who are divided. On Kerry’s conference call yesterday with House Democrats, Rep. Rick Nolan (D-MN) compared Syria to the Vietnam War, NBC’s Frank Thorp, Peter Alexander, and Kasie Hunt reported. Nolan added on the call that Obama officials were in the grip of "historic amnesia." The open question is whether a majority of House and Senate Democrats will back Obama on this authorization. Up until this point, almost anytime Obama has asked Dems to jump -- whether it’s been on budget and taxes agreements, the health-care legislation -- they’ve asked how high. Do they continue that practice? *** When the rhetoric doesn’t match the action: Beyond the politics, here’s another question we have: Has the Obama administration’s rhetoric matched the action it wants to take? Secretary of State John Kerry has made an impassioned case for military intervention. “Bashar al-Assad now joins the list of Adolph Hitler and Saddam Hussein have used these weapons in time of war. This is of great consequence to Israel, to Jordan, to Turkey, to the region, and to all of us who care about enforcing the international norm with respect to chemical weapons,” Kerry said Sunday on “Meet the Press.” On the other hand, everything that the Obama administration has said about the intervention is that it would be limited. But has Team Obama made the case for limited action? If Assad is akin to Hitler and Hussein, shouldn’t the U.S. be doing everything to topple him -- immediately? But that’s not the action the administration says it’s pursuing. The rhetoric hasn’t matched the action. *** Cuccinelli, McAuliffe begin their final sprint: Lastly, Labor Day always marks the beginning of the final sprint in Virginia’s gubernatorial contest. The Washington Post on yesterday’s Labor Day parade in Buena Vista, VA: “Along with firetrucks, a marching band and a three-kid contingent of Boy Scouts, Attorney General Ken Cuccinelli II (R) and former Democratic National Committee chairman Terry McAuliffe shared the parade route with their statewide ticketmates and Robert Sarvis, the little-known Libertarian candidate for governor.” Meanwhile, a new Cuccinelli TV ad spotlights his role in helping to free a man who was imprisoned for crimes he didn’t commit. A recent Quinnipiac poll showed McAuliffe leading Cuccinelli by six points among likely voters, 48%-42%. And it also had Cuccinelli with a worse fav/unfav rating (35%-41%) than McAuliffe (34%-33%) -- which could explain the purpose of this new ad.